Exciting day at Thomas Pottery as participants made their own woodland mushroom. Many signed up before the date and several joined in the fun on that day. Three sessions were offered, starting at 10:00, 1:00 and 3:00. Each lasted about an hour and a half. A welcome and short orientation, most importantly the location of the restroom, was the start of each class. Introductions were made including our two kitty cats, sweet little Opie and grumpy cat Susie. Next, an overview of the project was discussed as we looked at some finished mushroom caps. A demonstration of the steps to make the piece followed as I showed them how to cut the clay at a 45 degree angle, scratch the surface and apply slip to the area to be joined. Many design decisions was yet to be made. Pottery tools and patterns were available to each participant along with step by step instruction. As I explained how to apply texture to the clay using wooden rollers, sponge stamps and simple rubber stamps, I suggested which patterns they might combine together or use exclusively. The texture tools available to be used was unlimited, ranging from items found at a yard sale, to things found in the kitchen or purchased from a craft store or from the dollar store. I am always amazed at the choices and how participants combine different textures. Inspiration is glened from each session as we each create unique mushroom caps. Once the pieces are finished and all the edges are wiped smooth with a sponge, they are placed on a drying rack. A small slip of paper with their name and glaze color is put with their piece. The final steps to finishing the pieces is left to me. The wet pieces will take about a week to dry and will be fired twice. The first firing is a bisque firing, which will burn out any remaining moisture and organic material from the clay. Once the piece has been bisque fired the glaze color is applied and re-fired at a higher temperature which will melt the glaze onto the pot. When the pieces are finished, I will contact the participants so they can schedule a time to pick up their piece. Copper posts are included as the stand for the mushroom cap. The finished piece is a lovely garden ornament to be enjoyed for many years. Feel like you missed out on an opportunity? No you haven't, plan your own private Clay Party by calling ahead. Schedule your event in the morning, have lunch at a nearby resturant or bring a picnic and spend the rest of the day in Seagrove taking in more pottery than one can imagine. 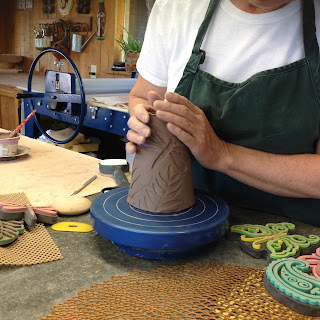 Experience clay through wheel turning or hand-building. Behind the scenes pottery experience is fun, educational and an inspiring time to spend with family, friends and co-workers. Birthday Parties, Team Building, Social Groups, or Ladies Night Out are perfect examples. Thomas Pottery offers a large studio space to accommodate groups up to 8 people. Try your hand at wheel turning or have fun hand-building your creation. Each party participant will have the opportunity to make several pieces of pottery finished and glazed in a dinnerware safe glaze. You are welcome to bring snacks, a picnic and your choice of beverage. We'll start your event with a brief orientation of the studio and gallery, a demonstration of the technique you choose will follow. Plan your casual affair by calling us at (336) 879-4145 to discuss your group needs and reserve a date. Pricing varies.